The Object 252U is a Soviet tier 8 premium heavy tank. Large lower glacis, although it is thick, it is eye candy for heavy hitters. In some ways, this tank resembles the old (pre 0.9.3) version of the KV-1S. It has an extremely powerful, but very slow-firing gun that can take out most enemies with a few shots. Also, unlike many Russian heavy tanks, it has good penetration on its standard ammunition. The main downside of this gun is the long reload time. This is exacerbated by the poor gun handling, which will cause misses at mid to long range. The armor is very strong, being both thick and well-sloped. From the front, its main weaknesses are the lower glacis, which is large compared to other pike-nosed tanks such as the IS-3 and the 110 and can be penetrated by premium rounds and the two cupolas on top of the turret. From the side, the armor just above the tracks can be penetrated easily by almost any gun it encounters. Alternatively, the side of the hull in general can be reliably penetrated by any gun that has more than 175 mm penetration (basically any tier 7 and higher). The best way to play this tank is to side-scrape and trade shots at fairly close range, using the massive alpha damage of the BL-13 gun to overwhelm opponents. However, the player should take care not to become isolated as the low rate of fire makes fighting multiple opponents a tricky proposition. The easiest way to counter it, is to flank. For the first part of its history please go to IS-6(object 252/253) In late November 1944, the IS-6 was radically redesigned. This is linked to research from NII-48. The tank received a new hull with a pike front and a new turret. 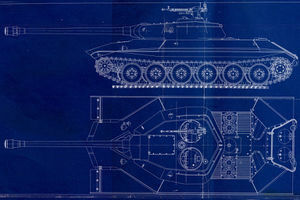 Since the IS-6 had no future in late 1944, the modernization project stopped there and it was never built in metal. The time spent on the tank was not wasted: work on a new tank began in the winter of 1945 with it as the foundation. This page was last modified on 8 November 2018, at 11:44.